This is one of the best stories for storytelling competition with moral for children. Long, long ago, a man went to see the Circus Show. Before the show began, he saw that a lot of elephants were held by only a small rope tied to their front leg. The man suddenly stopped, confused by the fact that such huge creatures were being held by such a thin yet small rope. There were no chains and no cages. It was obvious that the elephants could break away the ropes at any time from their bonds but for some reason were not even trying. 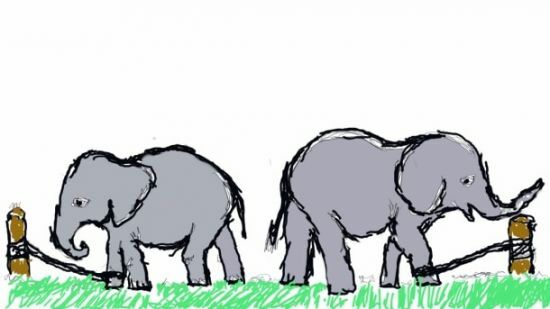 You may also like to read, Elephant And Dog Story. On hearing this, the man was completely shocked. He thought to himself, “These gigantic elephants could easily break the ropes and get free from their bonds but because they believed they couldn’t, they were stuck right where they were. They never even tried to make themselves.” Saying this, the man went away. Also, read The White Elephant. MORAL OF THE STORY: FAILURE IS THE PART OF LEARNING. YOU FAIL NOT BECAUSE YOU ARE DESTINED TO FAIL BUT BECAUSE THERE ARE LESSONS WHICH YOU NEED TO LEARN AS YOU MOVE WITHIN YOUR LIFE. ONE SHOULD NEVER GIVE UP THE STRUGGLE IN LIFE.